Since the latest â€“ and biggest â€“ Fifa bribery scandal broke last week, the South African Football Association (Safa) has consistently denied that it paid a $10-million bribe to any individuals for the dubious honour of hosting the 2010 soccer World Cup. 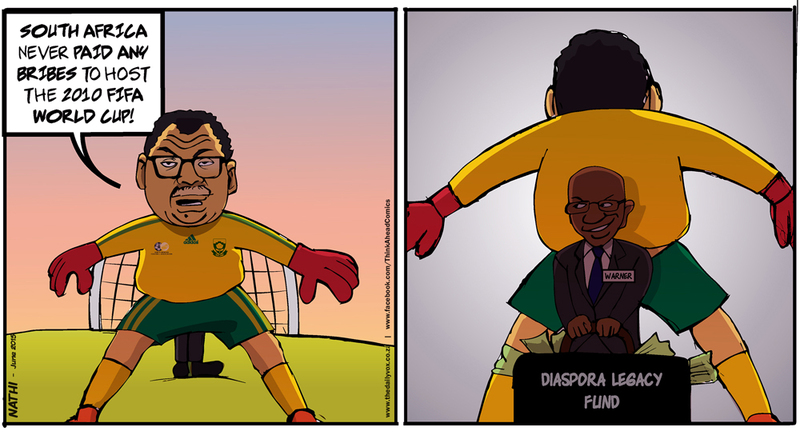 However, in a classic example of double-speak, on Sunday Safa president Danny Jordaan told the Sunday Independent, that while the local organising committee had indeed paid over R120-million to the Confederation of North, Central American and Caribbean Association Football â€“ headed by the infamous Jack Warner, one of the Fifa officials arrested last week â€“ this was not a â€œbribeâ€, but for its â€œfootball development programmeâ€. More like developing Jack Warnerâ€™s personal bank account, as a letter sent by South African officials to Fifa reveals. And with Sepp Blatterâ€™s resignation as Fifa president on Thursday evening â€“ just days after his re-election for a fifth term in office â€“ looks like the chickens are finally coming home to roost. Anyone taking bets on how long Jordaan remains mayor of Port Elizabeth?